Chronicles 350.org's 'Do the Math' bus tour as it launched the fossil fuel divestment campaign onto the national and ultimately international stage. As world governments struggle to meet the aspirational limit of 1.5�C of global warming agreed to at COP21 in Paris, a new campaign is targeting the fossil fuel industry in an effort to withdraw its social license to operate. DIVEST! chronicles 350.org's 'Do the Math' bus tour across the United States in 2012 as it launched the fossil fuel divestment campaign onto the national and ultimately international stage. 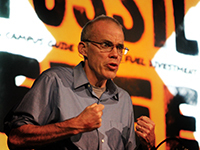 Each night Bill McKibben and special guests laid out the findings in his landmark Rolling Stone article 'Global Warming's Terrifying New Math' and made both the moral and historical case for divestment. Three years later over 500 institutions representing over 3 trillion dollars in assets have committed to divest. The campaign is winning, but with the clock ticking down the question remains: will the victories add up enough to matter? Featuring Naomi Klein, Reverend Lennox Yearwood, Dr. Sandra Steingraber, Josh Fox, Terry Tempest Williams, Winona LaDuke, Desmond Tutu and Ira Glass. "This video arrives at a remarkable time...Trump and Tillerson may be worried that they need to step in to 'save' the rich oil companies because 350.org and other like-minded efforts to promote renewable energy are being successful. I'd like to think so. Watch this program with that sense of hope and see if you agree." "Divest! serves as an inspiration and reminder to sociologists to engage actively in the social issues about which we do our research. We should not only analyze social movements and critique the capitalist modes of production that drive environmental destruction, social devastation of the already marginalized, and climate change. We must also ensure that our own institutions are moving toward a world that actively works against these injustices...The featured refrain, 'We can do better than this' seems truer than ever." "Divest! goes on a road trip with Bill McKibben, Naomi Klein, and others as they crisscross the country galvanizing people to confront the fossil fuel industry where it hurts--the industry's financial bottom-line. Part documentary, part call to action, one comes away asking not, 'What did I think about the film?' but 'What am I going to do now that I've seen it.'" "Divest! is a powerful testament to the importance of withdrawing support from the fossil fuel industry. As an important step in following up the Paris Accord, it vividly highlights the urgency of action. An excellent guide for community discussions." "Teaching students about the severity of the global climate crisis without pushing them into a ravine of hopelessness can be a very difficult task. DIVEST! presents a powerful solution to this pedagogical challenge...This remarkable film holds the potential to inspire courage and meaningful action among viewers." "Divest! puts the stars of today's climate change movement in the spotlight as they juxtapose the movement's chilling facts with its hopeful energy. This documentary is a valuable audiovisual complement to recent publications by Bill McKibben and Naomi Klein that is sure to stimulate constructive conversation in classrooms and living rooms alike." "Useful for older high schoolers to examine how grassroots action on climate change can make a difference." "Divest's message and technique is recommended especially at this time when the United States' political landscape is poised to change significantly for the first time in 8 years, and political and moral will to enact further climate protections seems unlikely." "The Climate Movement on Tour offers a telling glimpse of how the movement in 2012 sought to mobilize America with concert performances blending global warming science, inspiring speeches, and music. Useful for college and high school classes where students might find that the concert format helps them learn." "The film is filled with inspiring speeches, music, footage of actions, and voices from around the world...I recommend this documentary for college students and professors who want to communicate about climate change as well as inspire action." "Illustrate[s] the impacts of climate change and how people are rallying to stop it. The film is particularly geared to post-secondary students, although high school students could benefit from it as well." Includes SDH captions for the deaf and hard-of-hearing, and scene selection. Oscar-nominated director Josh Fox contemplates our climate-change future by exploring the human qualities that global warming can't destroy. Record of the massive peaceful resistance led by the Standing Rock Sioux Tribe to the Dakota Access Pipeline through their land and underneath the Missouri River. From floating neighborhoods to massive harbor floodgates, cities around the world are engineering ways to cope with extreme weather events. Shows that global warming is already hurting the Pacific Islands. A report from the front lines of climate change in Kenya, India, Canada, the Arctic, China, and Montana where people's lives have already been dramatically altered.